Ultimately the Chester flag is barely even visible from the interstate, but the public theater may have become more consequential (and self-defeating) than the flag display itself. After first decrying the placement of a flag in plain view of countless travelers in his wonderful Dead Confederates blog, Andy Hall conceded that the semi-secluded location made it a much less divisive symbol (see images of the flag in the Richmond Times-Dispatch). By then, though, the flag’s installation had been reduced to media theatre that reduced heritage to shallow talking points about honor and enslavement. 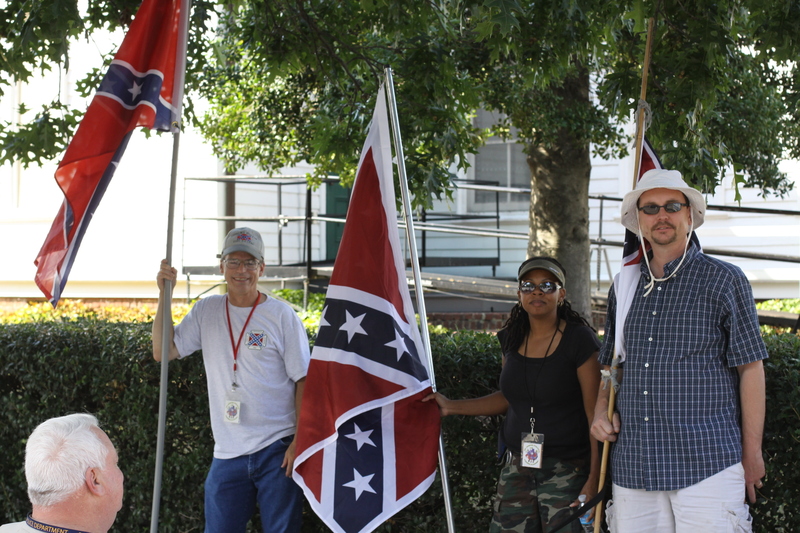 A Virginia Flaggers’ protest at the Virginia Museum of Fine Arts in 2012 (image from Gamma Man). 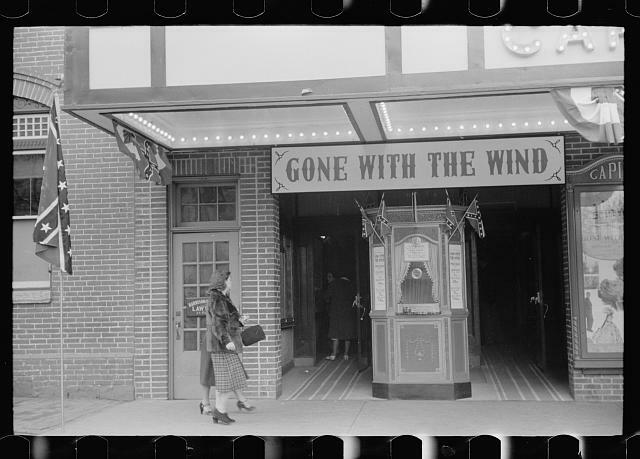 This Winchester, Virginia theater celebrated Lincoln’s birthday in February 1940 with a showing of “Gone with the Wind” and the display of Confederate flags (image from Library of Congress). Few of the slights to self-styled Confederate defenders have anything to do with the Confederacy at all; instead, they betray a variety of social anxieties projected onto history in poorly supported if not xenophobic forms. The stickiest dimension of the flag is contention over its racist implications; flaggers and new Confederates argue that the flag is a symbol of heritage, and for others the flag is stained by the perception that the Confederate cause fundamentally defended captivity. There is some truth to these contemporary views of the flag and Confederate heritage, but they have been reduced to polarized caricatures, and simplistic definitions of the flag provide little critical clarity. 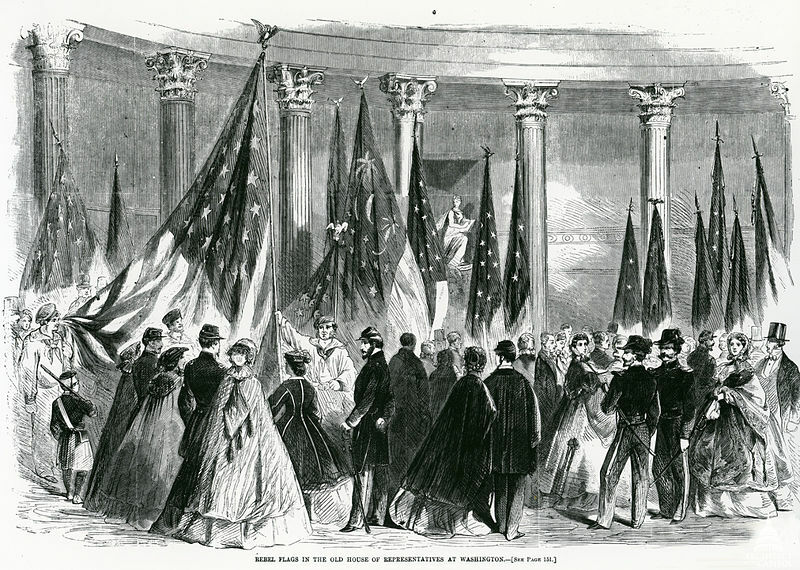 Captured Confederates flags were displayed in this post-war event in Washington (image Executive Office of the President of the United States). 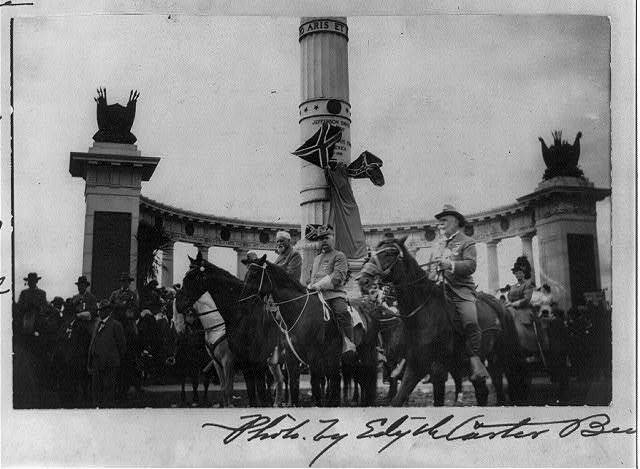 Yet in 1905 and 1906, in the wake of the Spanish-America war effort that included many Southern soldiers, Theodore Roosevelt ordered the federal government to turn over its captured Confederate flags to appropriate Southern states or historical societies, including the Confederate museum. 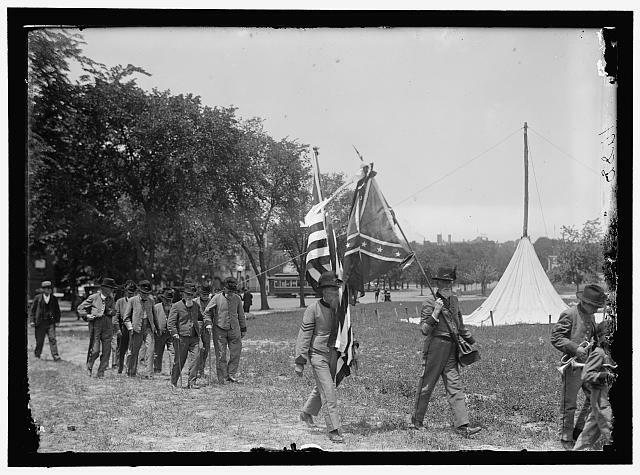 The flag was at least tolerated as a symbol of soldiers’ valor if not national reconciliation, even though its public displays did not pass without controversy: at both the 50th and 75th reunions at Gettysburg, for instance, some Union veterans objected to public displays of the flag as a symbol of unrepentant treason. 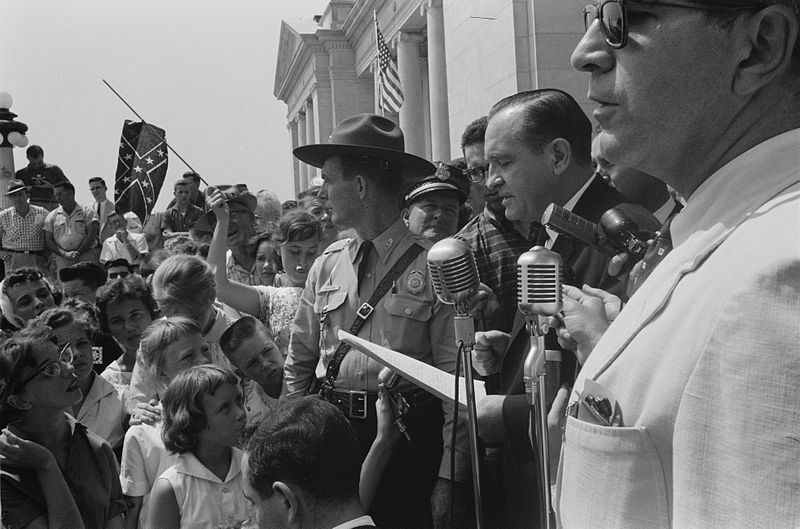 In 1959 the integration of Little Rock, Arkansas schools and the arrival of the “Little Rock Nine” was greeted by these protesters including the flag bearers in the back (image from Library of Congress). The flag’s various designs resurfaced in the wake of World War II and became intimately connected to a host of segregationist and boldly racist causes. John Coski’s detailed history of the flag’s public uses argues that the Ku Klux Klan’s first use of the Confederate flag came in 1943, when it was part of ceremonies among some of the hooded order’s Atlanta affiliates. In 1948 followers of the Dixiecrats registered their resistance to civil rights and support for segregation and state’s rights by embracing the Confederate battle flag, and it soon after began to appear at a range of Southern universities. In 1958 JB Stoner founded the White supremacist National States Rights Party, and the extremists closely allied to the Klan became one of a host of groups wielding the flag in the face of civil rights. Members of the anti-semitic and racist group were indicted (but acquitted) in the 1958 bombing of the Atlanta Reform Temple, and in 1980 Stoner (who later served as James Earl Ray’s attorney) was convicted of the 1958 bombing of the Bethel Baptist Church in Brimingham. 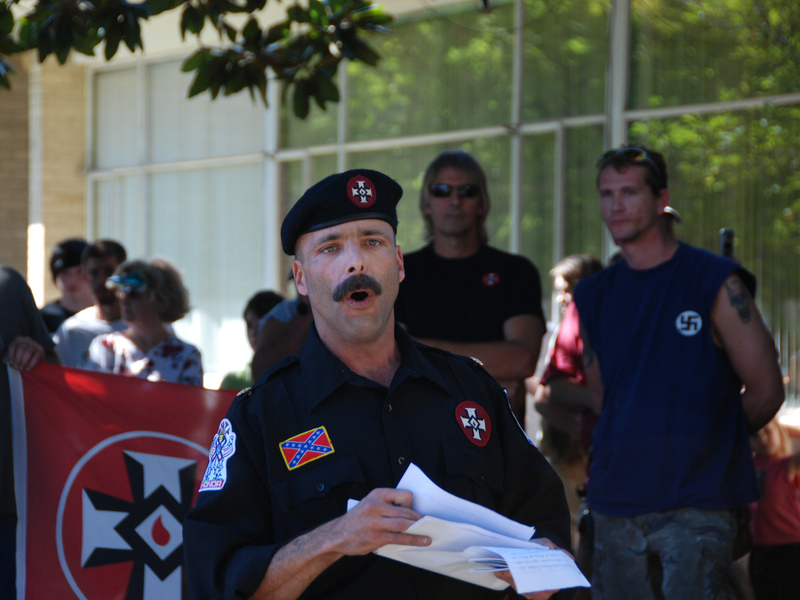 In 2007 Klansmen in an Athens, Alabama rally wore these uniforms with Confederate flags (image from Gregory Skibinski). It is naive for contemporary flaggers to suggest that extremists were caricaturing the flag’s “pure” historical meanings, because mainstream forces moved the flag into public space. In 1951 the “increasing vogue for display of the Confederate flag” moved Capitol police to bar cars bearing the flag from US Capitol parking. In 1956, the Georgia legislature approved a change in the state flag incorporating the Confederate battle emblem (it was modified in 2001). In 1961 South Carolina began to fly the flag on the State House dome (and resolved to keep it there in 1962) as part of the state’s Civil War centennial observance, which the state referred to as the “Confederate War Centennial.” The Mississippi state flag had integrated the Confederate flag design in 1894, and a 2001 state referendum to replace the design failed with 64% of the electorate backing the 1894 standard. Along the Chester roadside the flag has come to represent nearly nothing; instead, it simply implies raw enmity and an unwillingness to have a civil and critical discourse about the Confederacy and the Civil War. The Virginia Flaggers are by no means alone in their cause, with groups planning similar flag displays along Southern roadways including Georgia, Florida, and Alabama. Rather than promote a reflective, scholarly, and honest discussion about war, economics, race, region, and nation, the flag is instead publicly wielded on roadsides and bumpers to circumvent challenging discussions. The Confederate flag appeared in the hands of these North Carolina veterans at a 1917 reunion (image form Library of Congress). Several generations of scholars have been Civil War historians—and many more people are fascinated by the period—because it is in fact tortuous, compelling, complicated, and without any false explanatory resolution. There is no persuasive evidence that Confederate heritage has been ignored or radically distorted by a generation of liberal scholars and leftist ideologues. If anything, few corners of American scholarship are richer than Civil War history; nearly no period of our national history is better preserved; the Civil War figures prominently in high school and university curricula throughout the US; the material symbols of that heritage dot the American south and north alike; and a vast breadth of Americans across every social division are fascinated by the Civil War. 1965 Furl That Banner? New York Times 25 July: SM8-SM9, SM13. 2000 The Confederate Battle Flag in Historical Perspective. In Confederate Symbols in the Contemporary South, eds. J. Michael Martinez, William D. Richardson, and Ron McNinch-Su, 89-129. University Press of Florida, Gainesville. 1958 5 Negroes Enter Carolina School. New York Times 4 Sep 1958: 14. 2008 Neo-Confederacy: A Critical Introduction. University of Texas, Austin. 2000 Confederate Symbols in the Contemporary South. University Press of Florida, Gainesville. 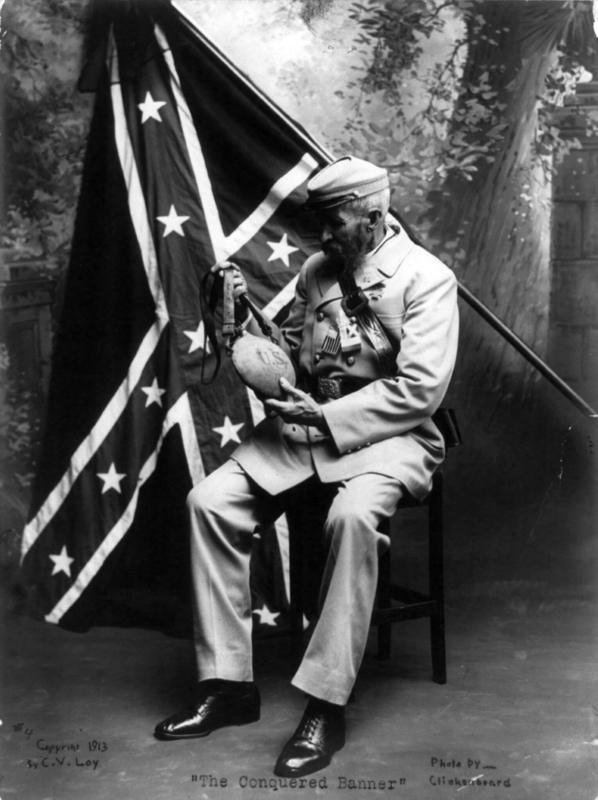 1892 The Confederate Flag: Commander Palmer Maintains his Position Regarding It. New York Times 9 Feb: 8. 1904 Cheered Confederate Flag. New York Times 18 Mar 1904: 1. 1951 Autos Flying Confederate Flags Barred From Parking at Capitol. New York Times 9 Nov: 1. 1956 10,000 in Alabama Hail Segregation. New York Times 11 Feb: 1. 2012 Enduring Legacy: Rhetoric and Ritual of the Lost Cause. University of Alabama Press, Tuscaloosa. 2007 Contemporary Southern Identity: Community through Controversy. University Press of Mississippi, Jackson. Posted on October 6, 2013, in Uncategorized and tagged #WPLongform, Confederate flag, flaggers, heritage, Richmond. Bookmark the permalink. 5 Comments. From what the press said, Susan Hathaway declined interviews for some reason. UnitedRVA stands for the unified, present-day Richmond VA – this is 2013, not 1863. Reblogged this on Let's to learn. Not having delved much into the history of the flag (my “work” on the South consists basically of 3 short essays on the history of the KKK), I always found the proudly stubborn use of a symbol of flagrant defeat a bit puzzling. This article puts it a bit more in context for me, and (here we go!) speaks directly to the historical honesty that I seek.